It was a big city, too big to care for all of its denizens and miscreants. Sure, the main drags and tall shiny office buildings glorifying the corporate suits that ran it all were well taken care of. But there were corners that weren’t; corners that didn’t want to be looked at and the money men didn’t want to see. At election time, they said the words, promised to throw money in that direction to ‘clean it up’, but once the back room power plays and hand shake deals were made and the betrayal of democracy had been shuffled through city hall once again, the promises were soon forgotten. Money could be spent in better ways, and the less said about the dark city corners, the better. No one ever went there anyway. No one that counted. One of the uncounted was Bobby. Born Robert Sullivan, but only his Momma called him Robert. On the street, he was just Bobby. To the gang bangers, the drug runners, the pimps, and the women of the night, he was just Bobby. A white boy in a part of town where that was a sin, he had to grow up tough. And he did, but with no way out he did what came natural to those who had come before and fell in with a gang that would have him. He wasn’t sold on the idea, but his one true friend from before a time when it was only the colors that mattered went and did what was natural, joining the Two-Two Boys and so Bobby followed suit. Someone had to look out for Tiny. Little Tino Martinez when he was a kid somehow changed to Tiny along the way and it stuck. Bobby and Tiny were inseparable, all the way up, and now spent their days marking the landscapes in graffiti colors and running the products of the boss’s deals around town, along with whatever other crimes and misdemeanors went with the territory. Bobby knew it was drugs, but Tiny said it didn’t matter – it was all they had and all they could do anyway. Bobby wasn’t so sure, but it was the truth for now, and ends had to be met. One of those ends had led him to finding Jamie, a beautiful girl, tender and tough, and they had done more than hit it off right away. Kindred spirits, they both wanted a way out, and being with her had him thinking there just might be a way. If he was strong enough, and for some unknown reason she believed he was, maybe he could fight his way out of this dark corner of town and take her with him to a brighter freedom together. He told himself it was a pipe dream, and it probably was, but it was funny what someone believing in you could do. It wouldn’t be easy to get out, ‘cause old habits die hard – but they do die, just like everything else. Bobby was thinking these thoughts and more on his way home when Tiny caught up to him. “Hey Bobby, hol’ up a sec!” yelled Tiny, as he ran hard to catch up. Bobby let out a long breath at the news. The Gangster Disciples had been pushing the Two-Two Boy’s turf and he knew it would come to war. He could somehow tell himself the drug running and occasional violence wasn’t that bad and that maybe he’d get out alive if he were smart, unlike many that hadn’t made it before and died young. But a gang war over turf was going to be bloody. This wasn’t just selling illegal products across town, this was death, and it was going to be up close and personal. Bobby didn’t want to die yet – not like that. Bobby let out another long breath. Somebody had to look after Tiny. He couldn’t see anything more than the way things were, and he believed he had a family in the gang. And to a point, he was right. They covered each other’s backs, but the gang also put those backs into danger in the first place. Bobby wanted out, but he wasn’t going to let Tiny down. He shook his head, feeling a wave of regretful premonition. Jamie got up and headed back out into the blue hazed dusk of the oncoming night. Before the door was even closed, something moved out of the dark corner booth at the back. A man, lean and mean, emerged from the shadows, dropping several bills on the counter before heading for the exit. He pulled his cowboy hat on low as he hit the door, keeping the quickly retreating young girl in his sight. Comments on "Tales of the Stranger: Episode 10, Part 1"
There seemed to be a couple of runon sentences in the first couple paragraphs, but after that it smoothed out. Nothing some slight editing couldn't fix. I like how you're taking your time to tell this story. Things are building up more slowly. 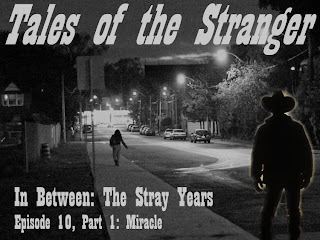 Compared to some of the earlier Stranger stories, they were really quick episodes of action that were over before they really began, and so you didn't really connect with the characters, and maybe some of the action felt forced. But this one, you slowly meet the characters, you feel the pain of this decision, the central character getting pulled in multiple directions. I really like it. I'm eagerly awaiting the next episode! thanks for the comments though. I guess this one is more of a slow burn than some of the others.